S161 EXTRACELLULAR THIOREDOXIN IS INCREASED IN PATIENTS WITH SEPSIS: A PROTECTIVE RESPONSE AGAINST RAISED PLASMA LEVELS OF MACROPHAGE MIGRATION INHIBITORY FACTOR? Thioredoxin is a 12 kDa ubiquitous redox-active thiol (-SH) protein that has protective, anti-inflammatory effects in the extracellular environment. Plasma levels of thioredoxin are raised in conditions associated with oxidative stress and inflammation. Macrophage migration inhibitory factor (MIF) is a 12.5 kDa protein with powerful cytokine and hormone-like actions and a catalytic thiol-protein oxidoreductase (TPOR) activity similar to that of thioredoxin. MIF levels are also raised in a wide range of inflammatory conditions. Despite similar TPOR activity, MIF and thioredoxin are thought to counterbalance each other, in part by regulating respective protein levels. We hypothesised that in patients with the systemic inflammatory response syndrome (SIRS) thioredoxin levels would increase to counteract the detrimental effects of MIF. Plasma from adult patients fulfilling the defining criteria for SIRS and requiring intensive care (n = 42) were compared with those undergoing oesophagectomy for carcinoma (n = 8) and with healthy controls (n = 20). Thioredoxin, MIF and IL-10, IL-6 and IL-8, were measured in all groups by ELISA. Levels of all increased significantly in SIRS patients when compared with healthy controls (table). Levels were also significantly raised 2 h post-oesophagectomy when compared with preoperative levels, returning to near baseline at 24 h. Thioredoxin levels correlated positively with those of MIF in the SIRS group (Spearman non-parametric analysis r = 0.69; p<0.001), post-oesophagectomy group (Spearman non-parametric analysis r = 0.86; p<0.05) and when all groups were analysed together (Spearman non-parametric analysis r = 0.62; p<0.001). By contrast, thioredoxin levels did not correlate with the levels of other cytokines measured in either patient group. The positive association between Trx and MIF levels demonstrated here supports the hypothesis that Trx levels increase to counteract the effects of MIF. S162 SOLUBLE RAGE AS A MARKER AND MEDIATOR OF EPITHELIAL DYSFUNCTION IN ACUTE RESPIRATORY DISTRESS SYNDROME? The receptor for advanced glycation end products (RAGE) was recently identified as a promising new marker of alveolar type I cell injury. RAGE is a multiligand receptor and is involved in propagating inflammatory responses and is expressed on the basal side of alveolar type I cells. Recently, plasma RAGE has been associated with both the severity and outcome in patients with acute respiratory distress syndrome (ARDS). The aims of this study were to evaluate RAGE levels in BALTI-1 patients, to ascertain relationships between alveolar capillary permeability and RAGE and to determine if RAGE affects primary human alveolar epithelial cell (ATII) wound repair in vitro. Methods: RAGE was measured in the BALF and plasma by ELISA. Wound repair was performed by scratch assay using 10–500 ng/ml of a RAGE upon human ATII cells grown for 4 days after extraction. Results: Median plasma RAGE was 2552 pg/ml in ARDS day 0 plasma, fell rapidly to 1018 pg/ml by day 4 (p = ns versus normal) and was significantly elevated compared with normal (median 846 pg/ml, p = 0.002). 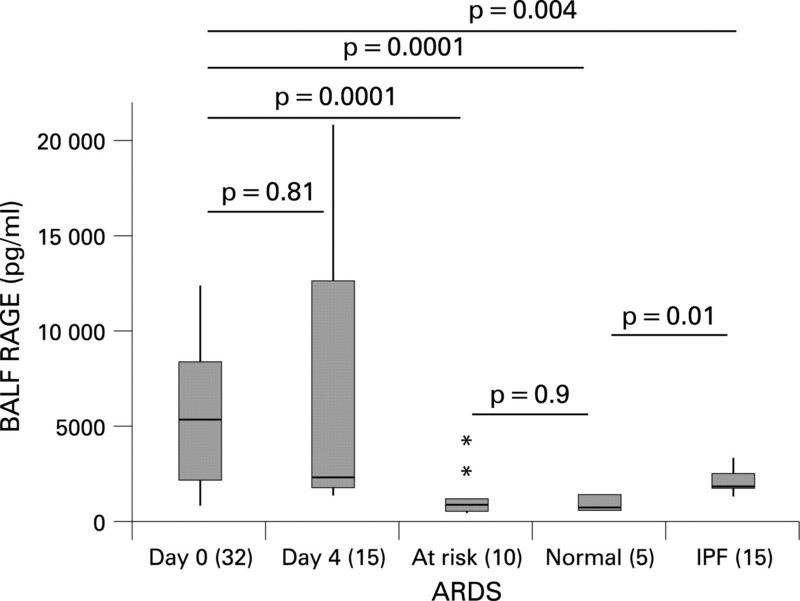 Plasma RAGE at ARDS day 0 correlated with PICCO catheter measurements of extravascular lung water (EVLW) (r = 0.32 p = 0.000). BALF levels of RAGE were elevated at day 0 (median 5376 pg/ml) compared with normal (685 pg/ml, p = 0.001), at risk (909 pg/ml, p = 0.001) and IPF controls (1887 pg/ml, p = 0.0039). BALF levels fell by day 4 (median 2330 pg/ml, p = 0.81). BALF RAGE at day 0 correlated with BALF protein permeability (r = 0.493, p = 0.01) but not with EVLW. There was no difference in plasma or BALF RAGE at day 0 between those who died or survived. In vitro RAGE inhibited ATII cell monolayer wound repair (analysis of variance, p = 0.001). Conclusions: RAGE levels are elevated in the BALF/plasma of ARDS patients in the early phase of the disease. Our data suggest that levels of RAGE reflect the permeability of the alveolar–capillary barrier potentially strengthening the case for using RAGE as a marker of alveolar epithelial damage. The fact that RAGE inhibits the repair of wounded primary alveolar epithelial cells in vitro suggests that RAGE may play a direct pathophysiological role early in the course of lung injury. Introduction: Injurious mechanical ventilation has been associated with increased soluble tumour necrosis factor receptor (sTNFR) expression in the bronchoalveolar lavage fluid (BALF) in patients with acute respiratory distress syndrome (ARDS). Both the mechanical stress causing ventilator-induced lung injury (VILI) as well as the underlying inflammatory process due to ARDS could individually contribute to such increases in sTNFR, but the precise mechanisms remain unclear. Using in vivo mouse models of VILI and lipopolysaccharide-induced pulmonary inflammation, in conjunction with an ex vivo isolated perfused lung (IPL) model, we investigated potential sources of sTNFR increases in bronchoalveolar lavage fluid (BALF). Methods: Anaesthetised C57BL6 mice were ventilated with high (36–41 ml/kg) or low (8–9 ml/kg) tidal volume (VT). A separate group of mice were treated with intratracheal lipopolysaccharide (20 μg). After 2 h of either protocol, BALF samples were taken and sTNFR p55 and p75 quantified by ELISA. Results: sTNFR levels in BALF were dramatically increased after high VT, compared with low VT (see table). These increases were accompanied by increases in BALF total protein, an indicator of pulmonary oedema. Strong correlations between levels of sTNFR and total protein were apparent (p<0.001), suggesting that the majority of BALF sTNFR originated from the circulation. This was tested in the IPL using perfusate that does not contain sTNFR. High VT ventilation in this IPL model induced pulmonary oedema but no increases in BALF sTNFR levels. In contrast to the VILI model, lipopolysaccharide-treated mice showed increases in BALF sTNFR p75 but not p55, in the absence of substantial pulmonary oedema. Conclusions: These results suggest that both injurious ventilation and intratracheal lipopolysaccharide can upregulate sTNFR in the alveoli, but via distinct mechanisms. sTNFR increases following high VT ventilation are likely to reflect leakage from the circulation (ie, degree of pulmonary oedema). In contrast, intratracheal lipopolysaccharide potentially causes shedding of receptors within the alveolar space, albeit for sTNFR p75 exclusively and sTNFR levels in this case could reflect the degree of intra-alveolar inflammation. Understanding these differences may be essential to interpret BALF sTNFR levels properly and design pharmacological interventions for ventilated ARDS patients. Funding: This work was funded by the Westminster Medical School Research Trust and Wellcome Trust. S164 VASCULAR ENDOTHELIAL GROWTH FACTOR: A ROLE IN FIBROSIS? Introduction: Fibrosis is the hallmark of many forms of lung diseases, notably acute respiratory distress syndrome (ARDS) and idiopathic pulmonary fibrosis (IPF). Vascular endothelial growth factor (VEGF) is a potent mitogen and survival factor for a diversity of cell types. It signals predominantly through VEGFR1 and VEGFR2 with co-factors NRP-1 and 2. We hypothesised that VEGF may contribute to the development of pulmonary fibrosis, a key issue in lung injury and repair. Objective: To determine the expression profile of VEGF and its receptors by pulmonary fibroblasts, the capacity of VEGF to induce fibroblast proliferation, to examine the potential for regulation of VEGF bioactivity by the soluble form of the VEGF receptor 1 (sFlt) and a potential inhibitory isoform VEGFxxxb. Methods: Primary normal human lung fibroblasts were obtained via an explant technique (n = 8). Expression of VEGF isoforms was established by Western blotting. Expression of VEGFR1, 2 and NRP-1 was established at both messenger RNA and protein level by reverse transcription PCR, immunofluorescence and Western blotting. The mitogenic effect on fibroblasts was assessed using 3[H] thymidine incorporation assays and haemocytometric cell counts in the presence of VEGF ± sFlt, the specific soluble inhibitor or the “inhibitory” isoform VEGFxxxb. Results: Human pulmonary fibroblasts express VEGF, VEGFR1, 2 and NRP1 at the mRNA and protein level. 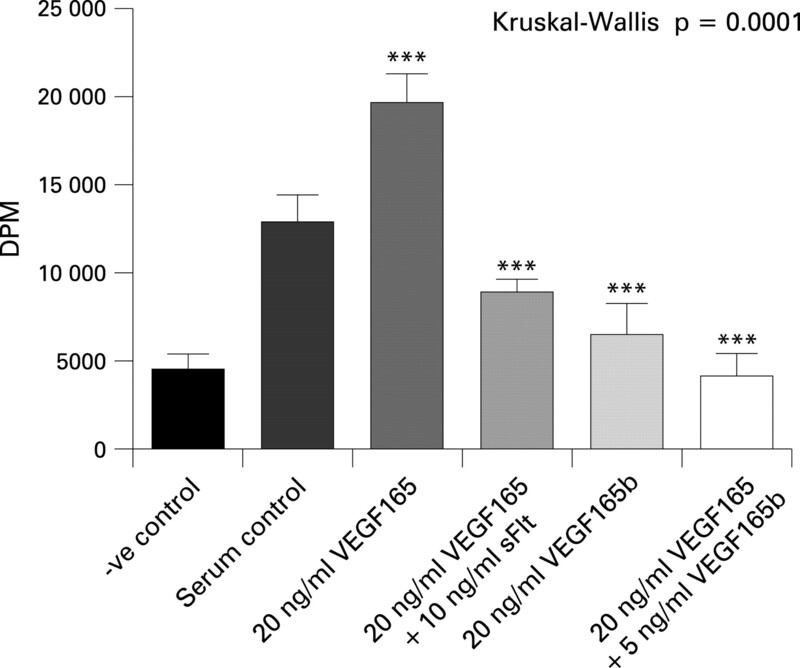 VEGF165 induced a significant increase in proliferation compared with serum control (p = 0.001). This effect was abolished by the presence of sFLT confirming its specificity (VEGF165 vs VEGF165 + sFlt; p<0.001). A similar inhibitory effect was shown in the presence of the VEGFxxxb isoform (VEGF165 vs VEGF165 + xxxb; p<0.001) (Kruskal–Wallis with Dunn’s correction) (see fig). Conclusions: VEGF induces proliferation of normal human lung fibroblasts, which is inhibited by both the soluble receptor sFLT and the inhibitory isoform VEGFxxxb. Fibroblasts express both VEGF and VEGFxxxb. These results suggest that VEGF has a potential role in the development of fibrosis, a crucial determinant in the outcome of lung injury. Introduction: Alveolar macrophages are key cells in the pathogenesis of acute lung injury. Hypoxia-inducible factor 1 (Hif-1) is a central regulator of myeloid cell function but its role in pulmonary inflammation is unclear. This study aimed to assess the role of Hif-1α in a severe pulmonary inflammatory insult. Methods: The alveolar macrophage MH-S cell-line was exposed to the Hif-1 inducer DMOG 1 μmol, Escherichia coli lipopolysaccharide 1 μg/ml or both for 24 h. Supernatant nitric oxide (NO; Griess assay) and tumour necrosis factor (ELISA) were measured. Western blots were performed for endothelial nitric oxide synthase (NOS), inducible NOS and neuronal NOS. C57Bl6 mice received intratracheal lipopolysaccharide (50 μg) or lipopolysaccharide (50 μg) plus DMOG (8 mg). Animals, killed after 24 h, underwent bronchoalveolar lavage samples and lungs were processed for nitrotyrosine immunohistochemistry. Myeloid cell-specific Hif-1α conditional knockout mice were used to generate bone marrow derived macrophages (BMDM) and were subjected to the intratracheal lipopolysaccharide model of lung injury. Results: DMOG and lipopolysaccharide increased MH-S NO production by similar amounts, whereas lipopolysaccharide plus DMOG had a significant additive effect on production (see table). Western blots showed MH-S cells constitutively to express neuronal NOS and endothelial NOS. Lipopolysaccharide greatly increased the expression of inducible NOS; DMOG increased the level of inducible NOS (to a lesser degree than lipopolysaccharide) but also raised endothelial NOS levels while lipopolysaccharide plus DMOG led to a further increase in inducible NOS. Lipopolysaccharide increased TNF release, whereas lipopolysaccharide plus DMOG significantly reduced TNF release compared with lipopolysaccharide. Intratracheal instillation of lipopolysaccharide and lipopolysaccharide plus DMOG induced a similar degree of neutrophilic alveolitis (1.5 × 106 and 1.3 × 106 PMN/mouse p>0.05). Western blot of BAL cells for inducible NOS and lung nitrotyrosine immunohistochemistry showed increased alveolar cell inducible NOS expression and increase nitrotyrosine staining in DMOG plus lipopolysaccharide treated animals. Hif-1α-deleted BMDM generated significantly less NO compared with wild-type (WT) controls (WT 28.76 ± 4.662, N = 12, knock-out 13.64 ± 1.919, N = 12, p = 0.007) and intratracheal lipopolysaccharide generated a similar alveolitis but greater nitrotyrosine staining in WT compared with knock-out animals. Conclusions: DMOG differentially regulates the release of NO and TNF from an alveolar macrophage cell line in vitro. In vivo DMOG increases NO-mediated pulmonary damage without affecting neutrophil recruitment. Hif-1α is a key regulator in NO-mediated cell injury. Introduction: Although monocyte margination to the lungs is enhanced during endotoxaemia, little is known of their role in sepsis-related acute lung injury (ALI). We have previously demonstrated that during acute endotoxaemia, lung-marginated monocytes activate pulmonary endothelial cells via tumour necrosis factor (TNF)-dependent signalling,1 and that during subclinical endotoxaemia, substantial numbers of bone marrow Gr-1high “inflammatory” subset monocytes marginate to the lungs and express enhanced levels of membrane TNF (memTNF) in response to secondary intravenous endotoxin challenge.2 Here, we investigate the effect of pulmonary endothelial cell contact on monocyte TNF expression using an in vitro monocyte–endothelial cell co-culture model. Methods: Primary mouse lung endothelial cells (MLEC) were isolated from C57BL6 mice. Using the same mouse strain, bone marrow Gr-1high monocytes were purified by immunomagnetic bead separation and enriched blood leucocytes prepared by erythrocyte depletion. Monocytes/leucocytes were incubated alone or with confluent MLEC monolayers and then stimulated with lipopolysaccharide (100 ng/ml). BB94, an inhibitor of memTNF cleavage, was added to cultures to quantify TNF production by individual cells. Levels of memTNF on monocyte subsets were determined by flow cytometry. 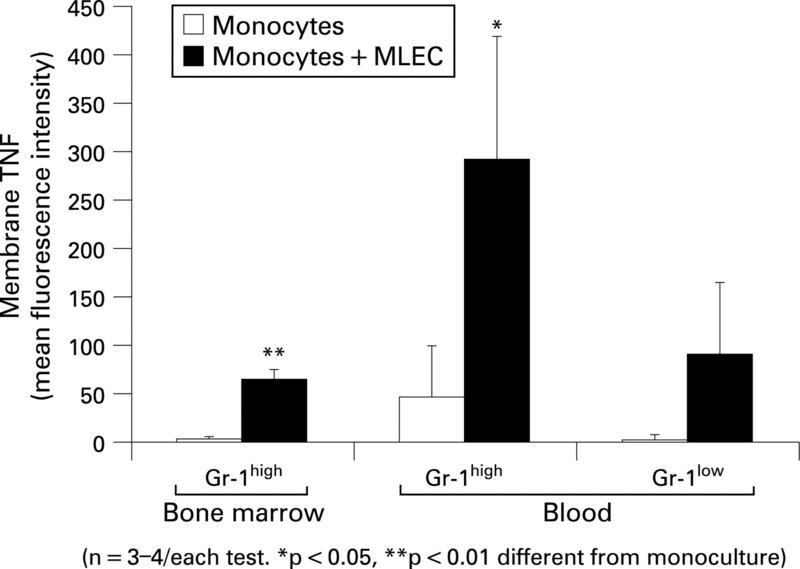 Results: At 1 h after lipopolysaccharide stimulation, TNF production (+BB94) by bone marrow Gr-1high monocytes and blood Gr-1high and Gr-1low monocytes was enhanced substantially by co-culture with primary MLEC (see fig). In the absence of BB94, memTNF expression, although lower than with BB94, was also enhanced by co-culture. Comparison of blood monocyte subset responses also indicated that Gr-1high were higher responders than Gr-1low monocytes, a result that is consistent with our previous in-vivo findings. Conclusions: These results suggest that contact with lung endothelial cells during exposure to septic stimuli is essential for optimal TNF expression by bone marrow and blood monocytes. This finding adds further support to the notion that during acute systemic inflammation the function of monocytes is primarily concerned with local cell-mediated effects within the microvasculature, as opposed to augmentation of the systemic soluble mediator response. Funding: This work was supported in part by BBSRC.
. Am J Respir Crit Care Med 2005;172:1119–27 .
. Proc Am Thorac Soc 2006;3:A203.